In 1988, Doctor Who had a special anniversary. Although no longer the biggest draw on British television, there were a number of celebratory events planned. One of these was a 25th anniversary story, which featured the return of one of the show’s most famous and beloved enemies, along with a number of nods to the history of the series and the mysterious background of the character. Unfortunately, that story was Silver Nemesis, and it was pretty rubbish. Which is a shame, because the same season’s Remembrance of the Daleks bore all the hallmarks of a subtle and clever anniversary celebration, while at the same time telling a gripping and inventive story of its own. In fact, some people might go so far as to call it the best Doctor Who story ever written. I’m certainly one of those people, although whether that’s just because of long-lingering childhood affection, or genuine appraisal of its quality over the likes of Androzani and Genesis and Tomb and Blink, I couldn’t objectively tell you. Either way, the very name of this site should tell you all you need to know about my feelings for it. In 2013, Doctor Who has another special anniversary. But while there’s every reason to believe that the Official 50th Anniversary Story will be a damned sight better than the Official 25th Anniversary Story, it’s pleasing to see that the Unofficial 25th Anniversary Story is also getting its due. Its Target adaptation, originally published in June 1990, has been chosen as the Seventh Doctor’s entry in a really rather lovely set of eleven novels reprinted by BBC Books. While telling the same story as the TV version, the Remembrance novelisation is an altogether bolder, wider-in-scope concern. In his introduction to this new edition, writer Ben Aaronovitch points to the Target novels of Malcolm Hulke in particular as the inspiration for an adaptation that would expand upon and lend depth to the characters featured within – not just the Doctor and his companion(s), but the one-off incidental characters as well. This approach, if done well, can elevate even the weaker TV stories into satisfying, fleshed-out literature. When you’re dealing with a story as good as Remembrance, though, then you’re left with an unquestionable, unmissable classic. While the Doctor takes a backseat for much of the story – we rarely get inside his head, although we’re treated to what are, let’s not forget, some pretty envelope-pushing flashbacks to his past, making far more explicit than the TV series that he had a role to play in the very conception of the Time Lords’ power and technology – focus is heavily shifted onto Ace, with Aaronovitch drawing on her background in Perivale to add further context (rather than her just being, you know, an inherently good person) to why she’s so disgusted by 1960s-era racism. There’s also a nod to the developments that would follow in Season 26, exploring the fact that Ace’s teenage years were passing before our eyes as her time with the Doctor went on – and that the grown woman of that last year is very much a different person from the effervescent teenager picked up in Dragonfire. Remembrance, for its part, captures her almost exactly between the two. But where the book really earns its crust is in its development of the supporting characters. The Intrusion Counter-Measures Group – or “proto-UNIT” as it’s hard to avoid thinking of them – feel so well-established that it’s hard to believe this is their first appearance, particularly when we go into the backgrounds of Group Captain Gilmore and Rachel Jensen. The fact that these two have a prior relationship history is almost entirely irrelevant to the story – yet it’s added detail that makes us care about them, particularly behind the stiff military facade of “Chunky” Gilmore. If there’s a misstep, mind, it’s perhaps that the book doesn’t really consider that it may have readers who aren’t familiar with the TV series – so including mention of post-contemporaneous material such as Jensen’s autobiography, for example, deprives us of any tension over whether certain characters will survive the story. Perhaps one of the more complicated elements of the TV version is the characterisation of Mike Smith – so likeable, friendly and dashing before his real motivations are revealed – and the novel does much to extend that, making clear that the personality that so immediately attracts Ace isn’t any kind of façade, but rather his genuine character. It adds complication to the abhorrent views he’s shown as holding – not that Aaronovitch, lest we forget the product of a famously left-wing household, is in any way sympathetic to those views, but he’s sufficiently fair as a writer to give context to them, and to make Mike a shade more three-dimensional than the TV portrayal allowed. It’s a potential essay in itself, but it could reasonably be said that – for all kinds of reasons relating to the structure, storytelling, grounded nature and character work – the TV version of Remembrance is the closet forerunner the original series presents to the 2005-onwards era. The novel, for its part, serves as a precursor to something else entirely – there are times when, the lack of salty language and/or references to shagging aside, it feels far more like reading a New Adventure than a Target novelisation. That’s far from an uncommon observation among fans, mind, but it has as much to do with tone as it does the plot and backstory elements it introduced. From a Doctor moving silently and calculatingly one step ahead of everyone else, to getting inside the head and emotions of the companion, it’s a “grown-up” story irrespective of tone or subject matter. It’s not without a good sense of humour, too – the notion of the Special Weapons Dalek being considered as “the Abomination”, and knowing it to boot, is especially choice. Aaronovitch notes in his new introduction that Remembrance is the work of a young writer tackling a prose novel for the first time, and to be fair, it shows at times – as good a story as he’s telling, his style is a little rough around the edges in places, and is certainly distinguishable from the sure-footed prose of his excellent Rivers of London series. In fact, though, this makes the achievement of the book’s overall quality that bit more remarkable – just as it is that the TV version was his first broadcast credit. A lively, rich, thrilling adventure, it’s tempting – particularly in the way it touches upon the creatures’ own mythology – to call Remembrance the definitive Dalek story. 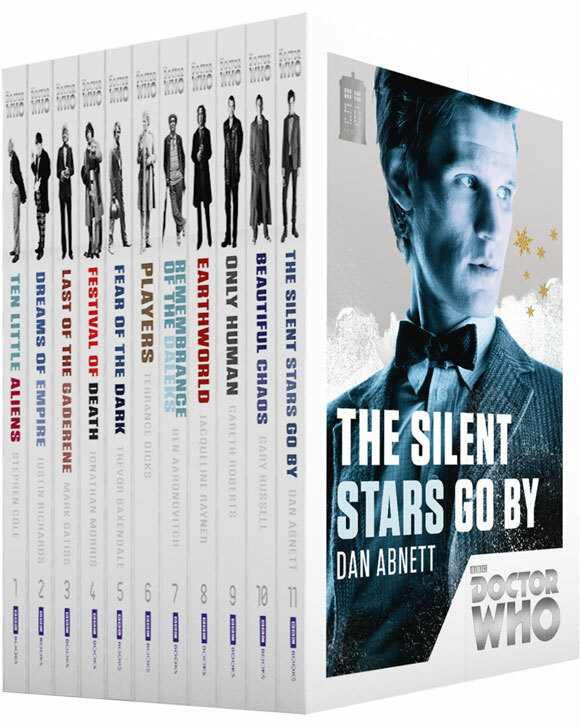 The novel may lack the punch and visuals of the broadcast version, but it remains one of the most remarkable pieces of “official” Doctor Who fiction produced in any form – and this handsome reissue will hopefully bring it afresh to the even wider audience it deserves. Seb Patrick once met Paul McGann, who immediately pretended to be Mark McGann. He writes for Den of Geek, BBC America, Film4 and the official Red Dwarf website, among others. He owns over thirty toy Daleks and wishes the Dapol factory tour was still open. DO you know if theres going to be a series about the TIMEWAR with PauL McGanN starting with wher the movie left of and finnshing at 8th to 9th doctor regeneration if not it shoud happen with expialning what happend to the daleks after the epizode WE NEED ANSEWS and fast.